Cosmetic Dentist | Invisalign in Owasso | Jayson D. Voto, D.D.S. For years, patients who wanted straighter teeth had one option: uncomfortable and unattractive braces. Thankfully, if you’re considering aligning your smile, you can now receive the same beautiful results in a much more comfortable and aesthetically pleasing way. With Invisalign in Owasso, Dr. Jayson Voto can shift your teeth into perfect position to restore your confidence and oral health. 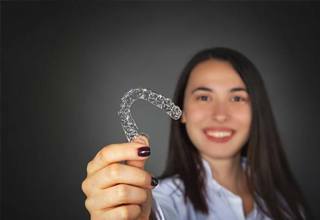 Keep reading to learn how Invisalign treatment can give you the smile of your dreams with more safety and speed than traditional braces. Invisalign treatment uses a series of clear plastic aligning trays to gradually shift your teeth into place. This slow shifting of teeth is similar to traditional braces, but it eliminates the need for permanently fixed brackets and wires. Dr. Voto will give your smile a careful examination to see how your teeth can benefit from Invisalign treatment. He will take special images and X-Rays of your smile, and then create your custom-made aligning trays accordingly. Once your trays are completed, you’ll wear each aligner for around 2 weeks at a time. These aligners should be worn between 20 and 22 hours a day, which means you should only remove them for eating and oral healthcare. On average, treatment can last from 10 to 18 months. The duration will depend on how diligent you are about wearing your aligners as well as the severity of your misalignment to begin with. Last but not least, you’ll wear a retainer after treatment is complete to make sure your straight smile is permanent! Invisalign treatment brings many benefits that you simply can’t get with traditional braces. First, the treatment time is much quicker than braces on average. Traditional orthodontics take 2 to 3 years to get desired results. Another benefit that Invisalign provides is that it gives you more free time. Braces require monthly visits to manually adjust them, while Invisalign treatment only requires a visit to Dr. Voto’s office every 6 to 8 weeks to ensure your teeth are shifting as planned. Lastly, Invisalign’s biggest advantage is its discreetness. 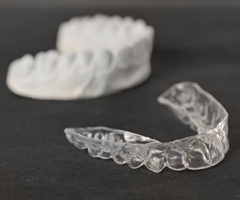 As their name may suggest, these aligning trays are almost invisible, so you can straighten your teeth at home, with friends, or at work without feeling self-conscious about your smile. Just be sure to clean them routinely so they remain transparent. Invisalign treatment is great for anyone with mild to moderate alignment issues. 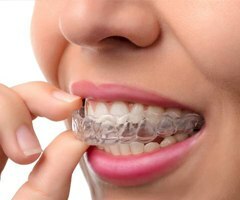 For more severe problems with your bite, traditional braces are still your best option. Additionally, if you have any existing dental issues like gum disease or weakened tooth structure, those problems need to be addressed before receiving Invisalign treatment. The top candidates for Invisalign are those who are committed to wearing their aligners and taking care of their oral health. The best way to know if Invisalign treatment is right for you is to contact Dr. Voto for a consultation. After examining your teeth and mouth, he will be able to provide the best treatment plan for you.